But what if this was only part of the hydration picture? Instead of asking "Are you drinking enough water?" We need to be asking "Are your cells properly hydrated?" Working in nutrition and as a colon therapist for many years, I still see so many people striving to get their eight glasses a day but not considering how they may be sabotaging their efforts at the same time. My question is always going to be "how many hydrating foods are we ingesting vs. "drying" foods?" Not merely water intake. This is especially important with a chronic illness like fibromyalgia where excess water retention or bladder issues may cause retention of urine. If you have fibromyalgia, are ingesting too many drying foods and/or food allergens, this can easily cause bloating, indigestion, and the inability to properly absorb critical nutrients. It’s not the water itself; no, water is good. In fact, water is great; it is after all, the universal solvent!! However, when too many “drying” foods are being ingested at the same time, then we not only defeat the purpose but we may end up "over watered and under nourished"
It’s always a better idea to get as much water as possible from the foods we are eating. This is nature’s way. Hydrolosis of carbohydrates and proteins plays an important role in our body processes such as assimilation of food and the transmission of nerve impulses. However, the source of the water used when it is broken down and reconstituted (hydrolyzed) with other available minerals is very important. Nature’s water is more alkaline and readily used and absorbed by every cell in the body. When we are eating an abundance of foods naturally high in water, then, we don't need to ingest as many glasses of water, and our cells will be better nourished from nature’s fluids which are higher in mineral content and therefore better utilized by the body. This is because ingesting too much water while eating a “drying” diet will not allow the water to properly hydrate our cells anyway. Additional water will simply be trying to create “balance” and unable to do its greater job of hydration. However, when we eat drying foods such as “heated” grains and oils (some examples include tortilla chips, popcorn, puffed grains, crackers and the like) these will absorb a great deal of water and therefore cause the body to “retain” more water. We surely do not want that. It is not to say that we can never have chips or high heated foods, but it is a good idea to limit these foods and choose more hydrating foods on a regular basis. How does this apply to fibromyalgia? 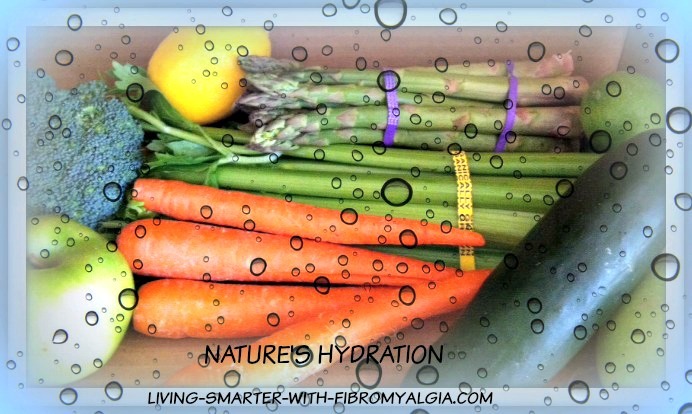 Simply due to the systems already affected in fibro and the propensity to retain water or bloating that can occur more commonly during a "flare" or due to IBS or other GI issues. The kidneys and liver actually work very intimately together. When one organ is compromised, this can affect all digestive organs. The kidneys are responsible for absorbing minerals just like the small intestines are responsible for absorbing and sorting minerals, vitamins and nutrients. Vegetables naturally high in water content include celery, cucumber, romaine lettuce, and radish. Even carrots and greens have excellent water content when juiced and blended. Fruits highest in water content include apple, pineapple, citrus fruits, berries and of course watermelon. Coconut water is also excellent and high in potassium, but not everyone will tolerate the natural sugars. In that case, you can either dilute with water as needed, say 2 oz. water for every 4 oz. coconut water. OR make coconut kefir by using a starter such as the one we use by Body Ecology. Also with fibromyalgia, the body has a more difficult time regulating body temperature and water balance, especially when the body is in a flare or during climate and weather changes. During a flare, we need to stay hydrated and this is a good time to ingest more of the “hydrating” foods and less of the “drying” foods. It is also important to reduce water intake during meals to avoid diluting our "in house" digestive enzymes. Taking oral enzymes is fine on occasion, but we should not depend on them at every meal. When reaching for a glass of water, choose quality purified water. Add some fresh lemon, lime or a very small amount of apple cider vinegar. NOTE: See the RECIPE page for my favorite liver tonics. These are great for the bile ducts and gallbladder. Drink water at room temperature when possible, as ingesting too hot or cold of liquid is not healthy for the liver and GI tract. Trigger points around the bladder or lower abdomen due to chronic myofascial pain or due to a previous abdominal surgery can also cause retention of urine in the bladder. Work with your doctor or a trainer therapist. Acupuncture may also be helpful. Stay hydrated…. just do it the smarter way...nature's way!! For additional related information click Blending & Juicing. (Easy and hydrating watermelon drink at bottom of juicing/blending article). Also, related info here. Irritable Bowel Syndrome. Thank you for reading. Lisa. FG.